In 1931 the Rottweiler was officially recognised by the American Kennel Club. 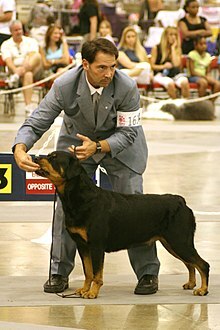 In 1936, Rottweilers were exhibited in Britain at Crufts. 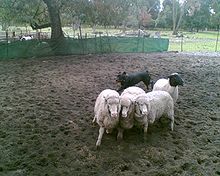 In 1966, a separate register was opened for the breed. In fact, in the mid-1990s, the popularity of the Rottweiler reached an all-time high with it being the most registered dog by the American Kennel Club. In 2013, the American Kennel Club ranked the Rottweiler as the 9th most popular purebreed in the United States. “Rottweiler breeders aim at a dog of abundant strength, black coated with clearly defined rich tan markings, whose powerful appearance does not lack nobility and which is exceptionally well suited to being a companion, service and working dog.” This breed is all about balance, endurance, proportionality, intelligence and strength. The various standards in place for the Rottweiler’s physical appearance specify these characteristics. The skull is of medium length, and should be broad, especially between the ears. The forehead line is moderately arched as seen from the side, with the occipital bone well developed without being conspicuous. The stop is well defined. The Rottweiler nose is well developed, more broad than round, with relatively large nostrils and always black. The muzzle should appear neither elongated nor shortened in relation to the cranial region. The nasal bridge is broad at the base and moderately tapered. The lips are black and close fitting with the corner of the mouth not visible. The gums should be black, or as dark as possible. Both the upper and lower jaws are strong and broad. According to the FCI Standard Rottweilers should have strong and complete dentition (42 teeth) with scissor bite, the upper incisors closely overlapping the lower incisors. The zygomatic arches should be pronounced. The eyes should be of medium size, almond-shaped and dark brown in colour. The eyelids are close fitting and should not droop. The ears are medium-sized, pendant, triangular, wide apart, and set high on the head. With the ears laid forward close to the head, the skull appears to be broadened. The skin on the head is tight fitting overall. When the dog is alert, the forehead may be slightly wrinkled. The traditional gait of a Rottweiler is a trot. Therefore, the Rottweiler is a trotter. Trotting in this breed is by no means a fault, and is required. This movement comes naturally to the Rottweiler and should appear as such; any deviation may lead to a disqualification in the show ring. 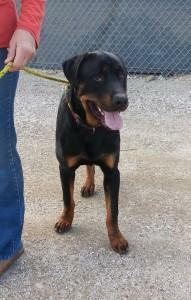 While walking, the Rottweiler’s legs, both front and hind, should move in a straight forward and backward manner. As with the straight movement of the legs, the path the Rottweiler moves in should also be straight. The Rottweiler’s gait is all about balance and effectiveness as the breed is still used as a herder today. 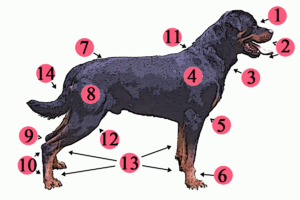 The Rottweiler is also exceptionally suited for and is commonly used in the dog sport of Schutzhund. 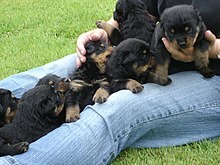 Rottweilers are a relatively healthy, disease-free breed. As with most large breeds, hip dysplasia can be a problem. For this reason the various Rottweiler breed clubs have had x-ray testing regimes in place for many years. Osteochondritis dissecans, a condition affecting the shoulder joints, can also be a problem due to the breed’s rapid growth rate. A reputable breeder will have the hips and elbows of all breeding stock x-rayed and read by a recognised specialist, and will have paperwork to prove it. 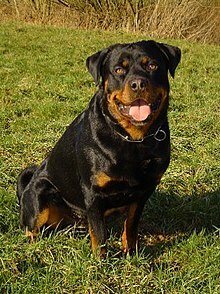 The portrayal of Rottweilers as vicious or malevolently aggressive dogs in several fictional films and TV series, most notably in The Omen, along with sensationalist press coverage, has created a negative image of the breed. However, some films and television shows, such as Lethal Weapon 3, the 1998 film Half Baked, and the hit HBO show Entourage, have portrayed Rottweilers in a positive light. They are also featured in the children’s book series Good Dog, Carl by Alexandra Day.